Launched in 2014, Casino Cruise uses a rather novel approach and breaks away from some of the usual themes used by most of the online casino. Inspired by a love of sailing deep into the open waters, Casino Cruise’s website is styled after a voyage at one of the Canary Islands, and as you might have imagined, everything is styled to look as fun as possible through the game’s theme. With such a presentation, we had to prepare a Casino Cruise review, just for you. We like how streamlined and clear the presentation is, a factor that makes it very easy for you to find your way around the deck. Coupled with a truly massive and immersive variety of games, Casino Cruise has the capacity of providing you with life-changing amounts that will see you off on a voyage around the world. The casino happens to be one of the most accessible and fun to use, and easily qualifies to be categorised into one of the most enjoyable sites to play on online. With its sleek sailing theme, a wide variety of games to choose from and an attractive mission statement ‘Bring Colour & Life to the Online Casino Industry, Casino Cruise is changing online casino entertainment in ways you couldn’t imagine. And with plenty of bonuses, including the unique mission challenge, it really seems to us that the horizon is only the limit for this voyage… Keep reading our Casino Cruise review, and judge for yourself. Casino Cruise is trusted and recognized globally for its user-friendly interface in addition to the stylish, superior online casino games. The casino’s excellent customer support services along with the appealing range of bonuses and promotions are some of the things that set this platform apart. The casino is part of the Genesis Global Limited, a company that has a longstanding reputation for running top rated casinos online. Casino Cruise is also a regulated and licensed online casino, which supports responsible gambling. If you want to attract people to sail into the unknown deep blue oceans then it’s important that you assure them of a state of the art ship, right? To us, it seems that Casino Cruise has used this approach and flown with it in software development terms, partnering with up to seven top rated companies to ensure that all the players on board have good reason to come back. 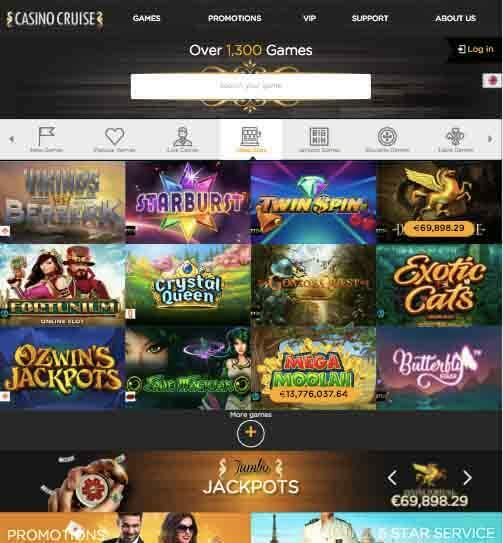 Sticking to the attractive ‘sail anywhere, play whenever and wherever you like’ vibe, Casino Cruise superbly designed website and gaming platform enables you to access it from all devices that can easily connect to a Wi-Fi signal or one that supports internet connectivity. You can easily play your favourite casino game through your tablet or mobile phone, or if you are at home, you can easily use your laptop or desktop’s browser. When we compare Casino Cruise with what some of the other online casinos have to offer, we must say that their game portfolio isn’t quite the best but this doesn’t mean that their offering is bad either. We say that it’s not the best that you can get because most of the other competing sites have more than 1,000 video slot games alone under one roof, while it only manages to accommodate a mere 600 games. Nonetheless, the slot games offered at the casino are varied to appeal to a wider audience. They come in different themes, styles of play and most importantly, different bet limits for you to choose from. You can opt to choose from the ever popular classic themed slot, modern video slots or visually appealing 3D slots. We liked this varied portfolio as it shows the casino’s continued commitment to ensuring that they meet every player’s gaming need without discriminating. Discrepancies in some of their terms and conditions. As we’ve already mentioned, Casino Cruise covers all the bases, which means that fans of slot games that were played yesteryear are also catered for at the site. You can choose to play 3 reeled slots featuring some of the vintage like symbols to your heart’s content, for free before committing some real money. Games such as JokerPro, Stickers, or Fruit Blast will surely take you down memory lane with their interesting themes that offer you simple action, entertainment and massive wins. If you are more modern than old school, then we highly recommend that you try playing Casino Cruise state of the art video slot games. These games use cutting-edge video slot technology that features crisp graphics that will thrill you as they introduce fictional storylines inspiring them to life. For instance, the casino has Gonzo’s Quest Slot – a game that draws inspiration from Gonzo, the great Spanish expeditor who never found the treasures he was looking for. While playing the game, the crisp graphics and vivid animations will make you feel as if you are truly with Gonzo himself. In addition to Gonzo’s Quest, you can play Hugo or Book of Ra slots that use very realistic sound effects, which will draw you right into the Swedish and Egyptian themed action. Other great titles that you can choose from the site include NetEnt’s blockbuster game Starburst – a game based on the 80’s arcade slot, as well as Guns ‘N Roses Slot. Casino Cruise Bonuses and Promotions: 100% up to £200 on Your First Deposit, And It Gets Even Better! Your bonus money usually appears in the bonus account, and it only becomes available once you’ve met the casino’s criteria. Also, the 200 free spins will be credited to your account in batches of 20 spins every day for the next 10 days. Once credited, you have up until 24 hours to claim them after which they automatically expire. You can only use the free spins on NetEnt’s popular slot game, Starburst. Cruise away promo: At Casino Cruise, they just don’t offer lip service as most of the other casinos do. They like actualizing what they say they are and as such, they’ll offer you an opportunity to go on cruises in different parts of the world. If you’ve always wanted to cruise to the Canary Islands in pure luxury, then this site is giving you the opportunity to. In addition to these two promotions, the casino also offers daily, weekly and monthly promos that vary from time to time depending on the time of the year. Together, they ensure that you get rewarded for choosing to sail with Casino Cruise through your gambling voyage! Just know that you can easily sign up for the VIP and qualify, especially if you are already a VIP player at any other casino brand. What Mobile Options Does Casino Cruise Offer? Besides promotions and casino games, Casino Cruise is also known for pushing boundaries, and they’ve done this by extending their reach to encompass a wide variety of platforms which players can use to access the site. Players using iPads, Tablets, iPhones, Android, Blackberry and other devices that let players have access to the internet can now be used to access all the services offered at the casino. Let’s have a look at this section of our Casino Cruise review. Those of you who always prefer playing casino games through mobile applications will be happy to know that the site has a mobile application, compatible with a wide range of devices. The app can be downloaded straight from the iOS app store as well as the Google Playstore (for UK players alone). As for Android users, you can download the Casino Cruise mobile app straight from their website. The easiest way to do this is Google search ‘Casino Cruise Mobile App’ and click on the link to the official site. The mobile app fits seamlessly on all screen sizes and will deliver a truly mobile experience. The games load exceptionally fast, and it uses minimum mobile phone resources. What we, however, didn’t like is the fact that it isn’t well arranged, which makes it a little bit difficult to use. If they could only improve on this, then everything about the mobile app would be perfect. To play the ‘mobile version’ of the website using your mobile phone, we highly recommend that you install the latest version of Adobe Flash player. This will let you access all the instant games directly on your device, no download required. We liked how the site has made it possible for all types of players to enjoy playing the game. It doesn’t matter if you prefer playing live roulette, blackjack or baccarat or simply fancy playing slot games, the mobile version of the site has been made easy to use. At Casino Cruise, they’ve ensured that their guests can get closer to the excitement and thrill only experienced at the land-based casinos by playing a wide variety of table games in their live casino suite. Powered by NetEnt and live dealer casino game specialists, Evolution Gaming, you can choose to play games such as Roulette, Blackjack, Baccarat, and Hold’em Poker. All these games are usually accessible from the site 24/7 at different betting limits, which we noticed start from as low as £1.00. There’s no better feeling while playing at the casinos than being served by someone who is friendly, welcoming and very eager to ensure that you have the best experience as possible. At Casino Cruise, this is what you can expect – highly trained, professional and experienced dealers who speak fluent English, without any accent. This makes it more enjoyable to play the games and more fun too! The casino’s live platform runs like a well-oiled machine across multiple platforms. In fact, if we are to use words to describe the live casino experience, it will be ‘it works like a dream’, and Android/iOS players can play the games straight from their tablets and mobile devices. You don’t even have to download any application as everything is accessible through your mobile browser without any glitch. We also liked how easy the site has made it for players to ‘hunt down’ specific games offered at the casino. Use the handy search feature if you already know the game that you wish to play or scroll down the neatly arranged games as you look for those games that look ‘appealing’ and more entertaining. If you have any problem choosing a game or deciding how to play it, just click on the ‘Chat’ box at the bottom of the left side of the screen. For your banking pleasure, Casino Cruise offers you a wide array of effortless deposit and withdrawal options while constantly ensuring the safety of your personal and financial information through the site’s strict security controls. If you’d like to cross check this yourself, you can look at the top right side of the screen where you’ll see the green HTTPS symbol with the padlock. That tells you that your gaming sessions at the casino are encrypted using the latest 128 Bit SSL technology. The following are the banking methods supported in the UK. For players living outside the country, some of these methods might not be available for you to choose from. Entropay, ecoPayz, Giropay, Sofortüberweisung, Zimpler, Trustly, Skrill, Neteller, Maestro, MasterCard, VISA, iDeal, Entercash and direct wire transfers. All these options can be used to make deposits at the casino. However, if you wish to make withdrawals, you might have to choose from a selected few options. They include Skrill, Neteller, Paysafecard, ecoPayz, and Paysafecard. Some direct competitors to Casino Cruise such as Kaboo usually have transaction fees to both withdrawals and deposits. They claim to use these fees to process payments faster and securely. This is however not the casino with Casino Cruise. All deposits and withdrawals are made free of any charges and promptly. By timely manner, we mean that all deposits are instantly processed, while withdrawals have varying times. eWallets, as usual, take the shortest time to process withdrawal requests, while direct wire transfers (transfer to the bank) takes between 3 and 5 working days to be processed. However, despite processing payments faster than any other payment option (12-24 hours with a 48 hour waiting period), eWallets have the lowest limit, while direct wire transfer has the highest transfer limits. To some players, limits don’t really matter a bit, but to others, their signing up to a casino greatly depends on how varied the withdrawal and deposit limits are. At Casino Cruise, they have large limits. Withdrawals are usually capped at a maximum of £30,000 per day. Casual players can deposit as little as £10 per session with no limit as to how much you can deposit per day. This is good news to those of you who consider themselves ‘The High Rollers’ as you can deposit as much as possible and enjoy playing your favourite casinos games. Limits and processing time vary depending on the level that you are enrolled at. 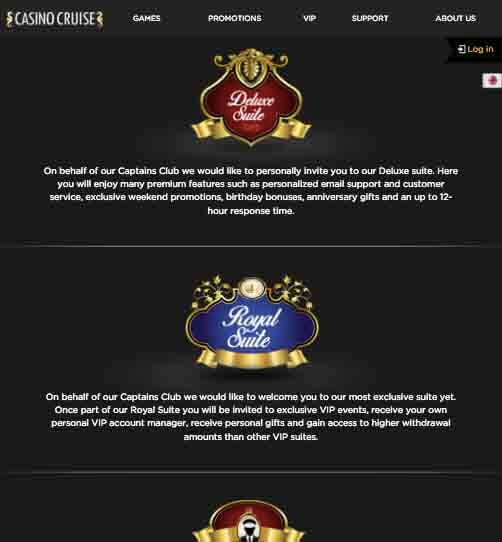 Those high in the Casino Cruise VIP get their payments processed within the shortest time possible as compared to those enrolled to the basic category. However, before making contact with the customer support team, it’s always advisable that you go through the list of FAQs and try to see if you can find the solution to your problem. If not, you can always reach to the able and professional agents to help you. Note that, as a casino focusing on serving European based players, Casino Cruise can be accessed through multiple languages. There’s Canadian, UK, and European English; there’s also German, Swedish, Norwegian and Finish languages supported. Recently, from the look of things under the language tab, it seems that Casino Cruise has also spread its wings to Africa (South Africa to be more precise) and the Middle East given that it also support South African English and Arabic. Casino Cruise features only games from the top software developers around the world as seen in our Casino Cruise review. Most of these software companies specialize in developing slots, which are interactive, fast-paced and will surely get you off your seat. Casino Cruise not only features a wide array of video slot games, but it also happens to be one of the safest sites to visit. Working closely with the Malta Gaming Authority and the UK Gambling Commission, the site endevours to bring to you a safe gaming environment where all your information, private and financial, remains as private as possible. There are several measures put in place to ensure that your voyage is as smooth as possible and secure in addition to the secure 128 bit SSL encryption. For instance, we noticed that they use the 3D secure technology – a feature that adds strong authentication for all players using credit and debit cards. A quick look at the terms and conditions will also reveal that the site is committed to providing you with the best security features as possible too! In the spirit of transparency, Casino Cruise usually has its game list audited often, and the results of the RTP published on the site. All players who wish to access the site’s services can click on the ‘Game Payouts’ option at the bottom of the page to reveal the results. With the kind of theme that Casino Cruise has decided to adapt, it would have been very easy for the design team to create a rather cheesy casino experience. Luckily, the team seems to have shown their thoughts out by developing a luxury cruise/voyage theme to fantastic effect. In addition to being a fun and attractive site, Casino Cruise is extremely easy to use. We liked the bonuses, the wide variety of casino games on offer, their VIP program and most importantly, the amount of jackpot. As a conclusion of our Casino Cruise review, we can only recommend it to you. If you’d like to experience a genuine first class operation, we should get on board Casino Cruise!